Fall in Love with your Nails this Fall. Fall fashion is upon us and we are loving this season’s looks. The catwalk trends have inspired us to get creative and start mixing these styles into our nail designs. Here are five of our favourite AW15 trends and how you can incorporate them into your nails. Valentino and Saint Laurent brought contrasting black and whites back to the runway with bold checks, zebra and optical illusion prints. This is a style you can have a lot of fun with. You can give a playful nod to the trend matching check print nails to a little black dress. Or go all out with your outfit in head to fingernail black and white stripes. The cut-out trend is well and truly here to stay. Cut-out pieces have been all over the high-street for the past couple of years and once again this modern look reappears on the AW15 runway, this time with a gothic edge. 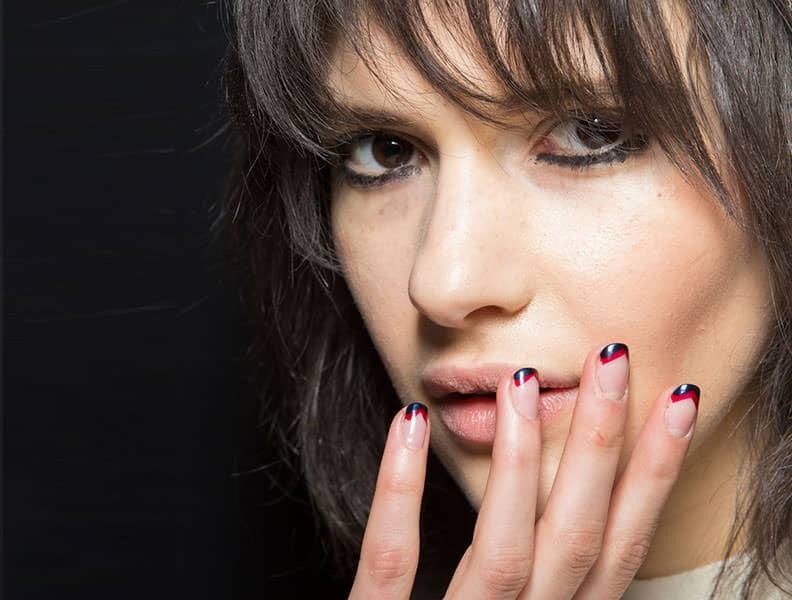 Negative space nail designs have made their catwalk debut, with geometric designs, swirly patterns and bold tips. Chloe, Mui Mui and Chanel all took us back to the 70s with suede dresses, jackets and well suede everything. While all over suede is a look most of us won’t dare to try, we’ve spotted some gorgeous suede miniskirts and gilets on the high-street. The look is perfect for Autumn, warm with the natural earthy shades that make us think of the season. Pair a tan suede jacket with Autumn coloured nails, think deep reds, dark purples and grey tones. Everyone from Bottega Veneta to Louis Vuitton featured darker looks with metallic and wet look finishes. Match a grungy outfit with reflective metallic nails for a high fashion look this Autumn. Our long-lasting love affair with denim is one we continue to cherish. We’ve seen denim fashion revitalised time and time again, from the flairs of the 70s, to baggy ripped jeans in the 90’s, to the modern skinny. Bleached looks and darker styles, it’s hard to imagine we’ll ever get bored of denim. This season denim is not just for jeans, there are no rules, and denim on denim is no longer a fashion no-no. Topshop and ASOS are full of denim shirts, dresses and jackets. The great thing about denim is that it goes with anything. Add a splash of colour and your nails will stand out. Be as experimental and creative with your nail designs and it will look great with any denim outfit. Remember our Fingernails2Go booths will let you print any design you’ve created on your nails, whatever you’re in the mood for, to match any trend.